UPDATED, Feb. 2, 2010 - José Benito Menéndez del Valle was released from prison on Jan. 23, 2010. 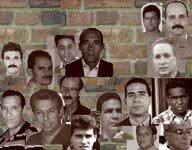 The particular "crimes" of Cuba's political prisoners may differ, but they are all bound by a shared goal: Liberty for themselves, for their fellow Cubans and for their country. Some, like José Benito Menéndez del Valle, even have been willing to sacrifice the freedom they have found in the United States or elsewhere to return to the island to fight. That might be considered a fool's mission, but it is still worthy of respect and recognition. Various online postings note that Menéndez, who is now 60, was arrested in 1994, tried and convicted — either for "acts of terrorism" or "rebellion" — and sentenced to 16 years in prison. I could find the circumstances of Menéndez's case discussed only Web sites run as part of the dictatorship's propaganda operation: Menéndez and another man were arrested after they were caught trying to infiltrate the island at Villa Clara province. Menéndez has spent most of his time in the gulag under a special punishment regime, but that has not prevented him from telling the world about the hell he witnesses each day. For instance, in July he reported to a Cuban independent journalist that several prisoners at the Quivicán prison had fallen ill after drinking contaminated water. And this past week, Menéndez complained to another journalist that prison officials continue to deny him the most basic human rights. The food is bad. Guards degrade their captives. There is not even basic health care. And in Menéndez's case, guards will not let him call on the telephone his children and other family in the United States. "This is hell," Menéndez said.